Travel less than an hour from Melbourne’s CBD and find yourself transported into the glory of Victoria’s Yarra Valley. Nestled at the foot of the Great Dividing Ranges, Rochford Wines is proud to offer its guests a unique and exciting Yarra Valley winery experience. At Rochford Wines we pride ourselves on the production of premium quality wines that express the true character of our vineyard sites. Winemaker Andrew Leitch produces high quality wines with fruit sourced from our vineyards, located in two of Victoria’s premium cool climate wine regions. Together, with the viticulturalist, Andrew works to ensure that the vineyards in the Macedon Ranges and the Yarra Valley produce only the finest of grapes to be used in the making of our wines. The story of Rochford Wines has its beginnings in the hamlet of Rochford, on the northern slopes of Victoria’s Macedon Ranges. The 270-acre property with functional winery was purchased by the Konecsny family in 1998. Less than five years later, the Konecsny’s purchased a second winery, Eyton on Yarra, located in the Yarra Valley. Shortly thereafter, this property was renamed Rochford Wines, in keeping with the brand already established with the original winery in Macedon. At the same time, the property was significantly redeveloped to improve the layout and design of the Cellar Door, Barrel Room, Observation Tower and Art Gallery. The existing amphitheatre was also extended to accommodate larger concerts and outdoor events. This dynamic winery destination is certainly a highlight of the Yarra Valley. At Rochford Wines we offer our guests an opportunity to sample award-winning wines at our cellar door, enjoy a meal in our restaurant or café, appreciate the landscape by looking out over the estate from the observation tower and take in a bit of culture with a stroll through the art gallery. Our beautifully designed, contemporary facility also functions as a special events venue for birthday and anniversary celebrations, weddings, corporate functions, car club displays, drive days, coach tours and more. This summer sees the commencement of the Rochford Twilight Experience. 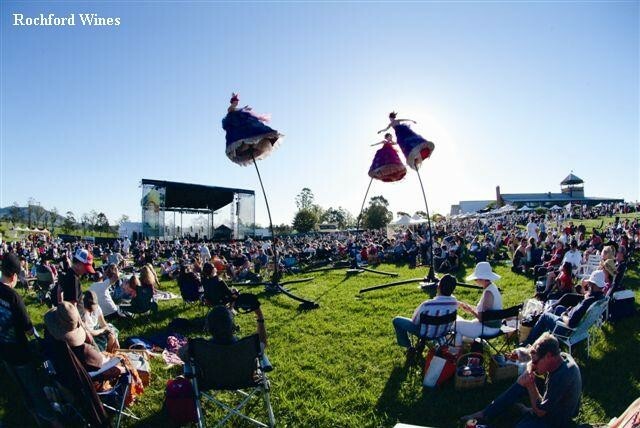 Enjoy Rochford wines and movie blockbusters amongst the vines and under the stars. Rochford’s 4WD Track (Coming Soon) allows you to test your nerves and skills in The Swamp. Clamber your vehicle out of The Channel. Stay afloat over The Rails. The track is ideal for vehicle launches, training days and corporate events. Rochford is also the home base of Global Ballooning; Australia’s most professional ballooning company. Rochford Wines is also renowned for hosting a high-calibre concert season. To date, artists such as Joe Cocker, Chris Isaak, Norah Jones, Crosby Stills & Nash as well as Rod Stewart have entertained thousands at Rochford. Rochford Wines is proud to offer all of our visitors a total Yarra Valley food, wine, arts and entertainment experience.